Preheat the oven to 180C/350F/Gas 4. Alternatively, light the barbecue. For the kofte, mix together all of the kofte ingredients in a large mixing bowl until well combined, using your hands. Divide the kofta mixture into 16 equal portions and roll each into a small sausage shape. Place the kofte onto a non-stick baking tray and cook for 10-12 minutes, or until completely cooked through. Meanwhile, for the glaze, pour the honey and pomegranate molasses into a small pan and heat gently until warmed through. Keep warm. Remove the kofte from the oven, spear each one straight through the middle with a cocktail stick and arrange on a serving platter. 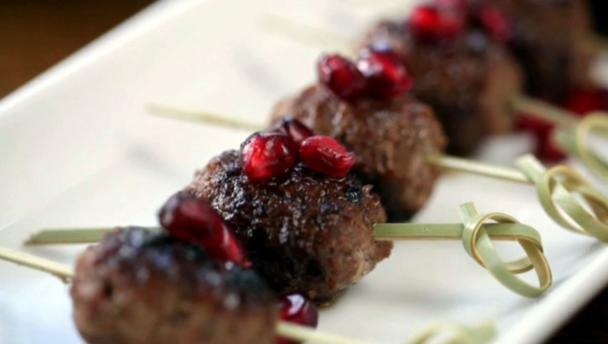 Lightly brush the kofte with the warm glaze and sprinkle over the pomegranate seeds. Serve immediately.